Find the rate of change (i.e. 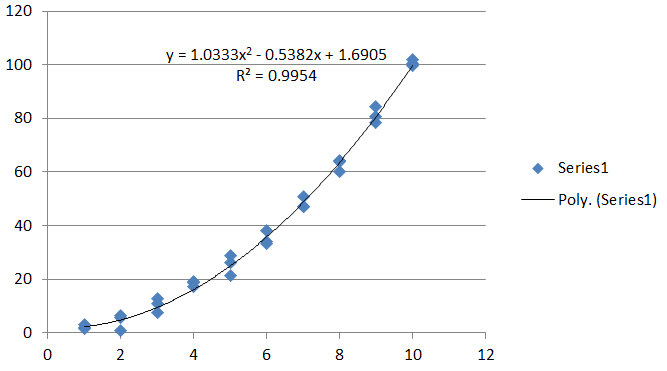 the slope at that point of the regression equation) at point 6 (the x axis value), and give the standard error of that slope. Like the model for $y$ itself, this is a linear combination of the parameters $(\beta_0, \beta_1, \beta_2)$ (with coefficients $c_0=0,c_1=1,c_2=2x$). That is key. Its square root is the standard error of the slope at $x$. 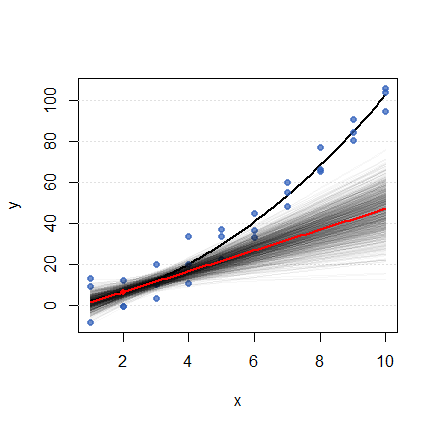 This easy calculation of the standard error was possible due to the key observation previously made: the estimated slope is a linear combination of the parameter estimates. Its square root is the standard error of this linear combination of coefficients. Estimate higher derivatives, partial derivatives (or indeed any linear combination of the coefficients) and all their variances in a multiple regression model using the same techniques: differentiate, plug in the estimated parameters, and compute the variance. Using this, I drew one thousand randomly generated tangent lines for $x=6$ (assuming a trivariate normal distribution for $(\hat\beta_0,\hat\beta_1,\hat\beta_2)$) to depict the variance of the slope. Each line was drawn with high transparency. The black bar on the figure is the cumulative effect of all thousand of those tangents. 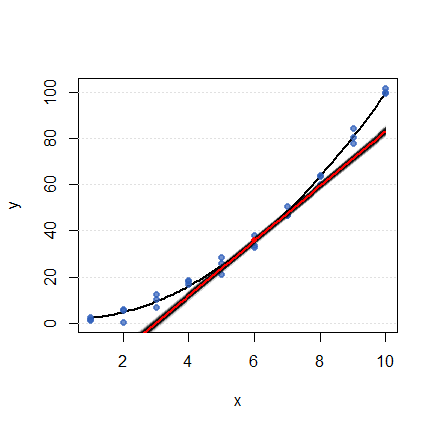 (On top of it is drawn, in red, the estimated tangent itself.) Evidently, the slope is known with some certainty: its variance (by formula $(1)$) is only $0.024591$. Since the intercept of the curve itself is much less certain (its variance is $2.427$), most of these tangents differ only in elevation, not in angle, forming the tightly collimated black bar you see. To show what else can occur, I added independent Normal errors of standard deviation $10$ to each data point and performed the same construction for the base point $x=2$. Now the slope, being much less certain, is manifest as a spreading fan of tangents. Not the answer you're looking for? Browse other questions tagged regression standard-error calculus or ask your own question. How to calculate the specific Standard Error relevant for a specific point estimate within a linear regression? How is the formula for the Standard error of the slope in linear regression derived? How do you calculate the standard error of a factor in the slope and intercept of a linear model?